I have always wanted to find a piece of sea glass on the beach. 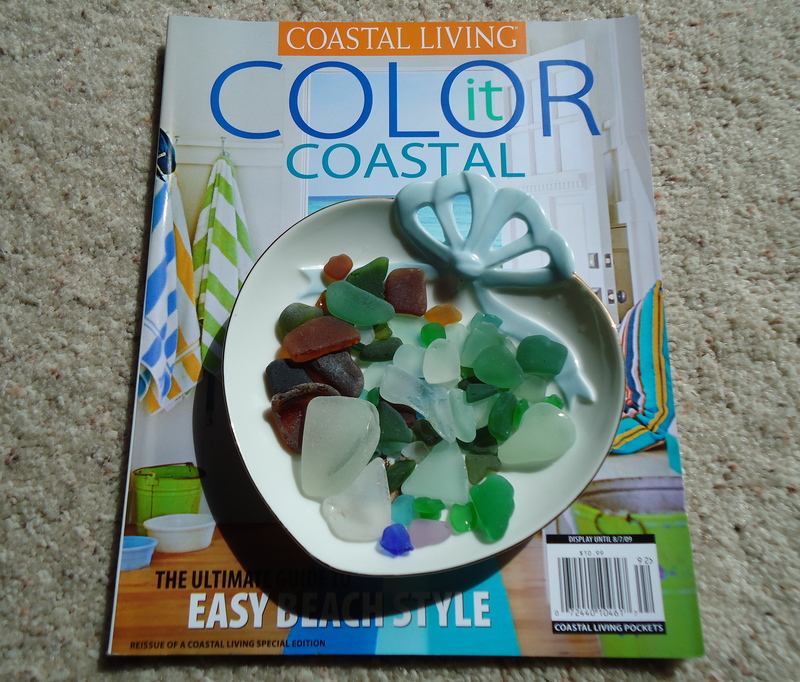 I’ve been saving an old issue of this magazine because it has a great article about sea glass, and because I adore the blue and green color palettes of the coastal decorating styles featured. I was chatting with a friend at school recently about sea glass. Turns out he had buckets of it at home from frequent trips to the Bahamas. He brought me a jar full of these treasures! I am planning to make a wire-wrapped pendant with some of the loveliest pieces. I’m still hoping to find a piece of sea glass myself someday, but this is almost as good. I love sea glass too…and like you have never found any myself. Someday…the best I have now is my “sea glass” quilt and some pieces I bought at a craft shop (not sure they are really sea glass, but they look like it)! That was very sweet of your friend! If you go to California’s beaches, you won’t have any trouble finding sea glass… I picked up loads of it there, but left it in California, or I’d give you some, too. There’s a beach way up in northern California called Glass Beach. You’d die! It’s gorgeous, and full of bits of sea glass, as the area used to be a military landfill. There were also pieces of copper, turned green from the exposure to elements… it’s a very unique and beautiful beach. I also found pieces of worn down porcelain and pottery shards. It’s very cool! I love the color of the green sea glass, it would go great with a dress I just bought. Perhaps you can show us your necklace when you get it done and we can all learn how to do it. Love those colors. They are so fresh looking to me. Lucky girl. Can’t wait to see what you do with them. You need to plan a trip. I think that sounds good. How fun! What a beautiful selection he brought for you! I can’t wait to see the pendant you make! Come visit me. We’ll go to a great place at the coast and search for sea glass! 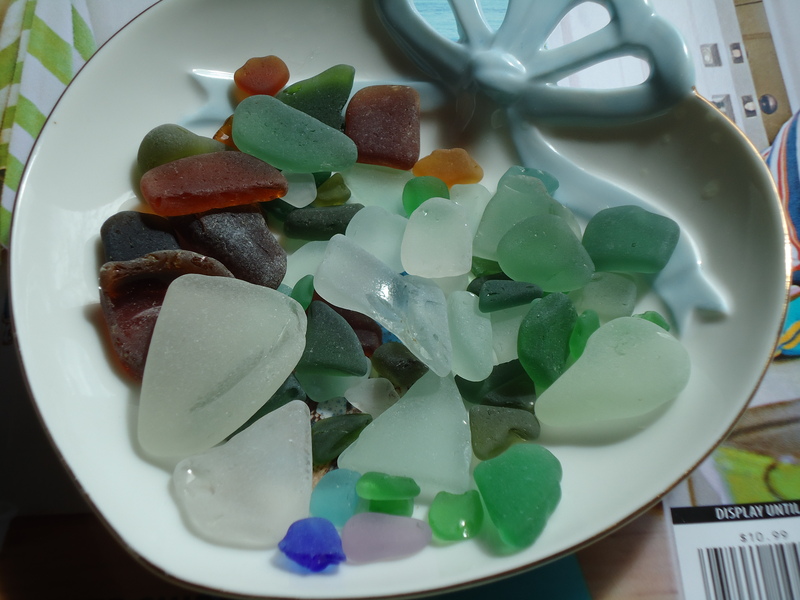 Sea glass is soo beautiful and IT IS hard to find isn’t it:) Happy you were able to score some! Your pieces of sea glass are just so beautiful. Looking forward to your new piece of jewellery. Our new house colors are all based on sea glass (I literally picked them up a week ago!)! Seriously, sometimes I swear we are related! I love the wire wrapped pendant idea, be sure to put it up when you’re done! Looking forward to seeing what you do with your ocean treasures. my mother lives right on pugent sound and gave me a whole bag of beach glass~awesome! I’ve kept it forever, thinking I’ll eventually make something of it. who knows. Dearest sweet terri, these sea glasses are gorgeous and so precious. 🙂 Have a lovely merry happy weekend and love to you! Very pretty! I often see all those colorful rocks at the beach…but not sure what I would do with them. Can’t wait to see your creation! Also, just wanted to stop by and thank you for your comment on my blog, means a lot.